Haq's Musings: Mumbai Attack Confession: Rare "Jihadi" Invokes "Bhagwan"
Mumbai Attack Confession: Rare "Jihadi" Invokes "Bhagwan"
I recently had the opportunity to view the "confession video" of a man alleged to be Ajmal Kassab. Kassab was reported to be a young Pakistani from Southern Punjab and the lone survivor of Mumbai terrorist attacks on November 26, 2008. These videos are said to have been made the same day the accused was captured after the attacks. 1. When you hear the soundtrack of this video, does this man sound like a person born and raised in the town of Faridkot in Okara District of Pakistan's Punjab province? This question is particularly addressed to people of Pakistani Punjab who are familiar with the local accents. 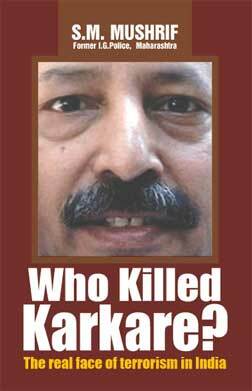 Terror in India: Who Killed Karkare? And that 'kia jehad saab' just before bhagwaan bit, then there"s 'kidar b ni gaya', 'hoynga' , 'paisa deta ay baho'. Everyday terms I hear used by indians all the time. The most incriminating evidence of Ajmal Kasab belonging to Faridkot came in an investigative report aired by Geo TV a few days after the incident. With such reporting by the most influential Pakistani media house, we don't need external forces to destabilize the country. No doubt we have absolutely free media where enemies of state can equally benefit if not more. The influence of TTP, LeJ, JI and other extremist jihadis in Pakistan owes a lot to the country's free media. Suhail: "The most incriminating evidence of Ajmal Kasab belonging to Faridkot came in an investigative report aired by Geo TV a few days after the incident." Forget what Geo-Jang or Dawn or anyone other media says. Just listen to the confession video soundtrack as a juror would and tell me if this person in the video sounds like a born-bred rural Pakistani Punjabi? Indians had to hang someone to give closure to the families of the 100+ killed in Mumbai. The question is - what the f--- was the Pakistani government officials were doing to properly defend a Pakistani. The fact is that with Pakistan's own leadership as corrupt and supportive of the terrorists, they did not want to look bad defending a Pakistani convicted in a foreign country, regardless of how weak the evidence would be. These MFs did not even counter when Pakistan Navy's Atlantic airplane was shot down over Pakistani territory by Indian MIG and when Indians routinely killed Pakistani army and rangers in Kashmir. LOL. Here comes another conspiracy theory. But what else do you expect from people in denial. The case against Kasab was based on stacks of evidence. Zabiuddin Ansari or Abu Jundal who was the handler of the 10 terrorists from Pakistan, was arrested by Indian agencies after he was deported by Saudi Arabia. His phone conversations from Pakistan during the Mumbai attack were intercepted and were on record during the hearings. Not only that, there were hundreds of evidences that left it beyond doubt that Mumbai attack was planned and directed from Pakistan. Ajmal Kasab belonged to Faridkot in Pakistan is a known fact. That the attackers were handled and directed from Pakistan is a known fact. There is enough evidence to prove that. The court case against him was an open one. Even Pakistan's government has accepted this fact. They don't deny it like you. But of course, you are free to believe (and start your own) conspiracy theories. One of the prime suspects in last year's Mumbai terrorist attacks suddenly withdrew his confession today and claimed he had been framed by police. Mohammad Ajmal Kasab is on trial in Mumbai accused of being the lone surviving gunman from the attacks, in which 166 people died over three days in November last year. Prosecutors are adamant that Kasab is the young man seen clutching an automatic rifle and striding through the city's railway station in a picture that has become the iconic image of the attacks. Kasab insisted today that this was not the case, smiling as he set out his new version of events. Far from arriving by sea with the other gunmen on the night the attacks began, he said, he had pitched up nearly three weeks earlier hoping to break into the Bollywood film industry and had been picked up by the police three days before the attacks for being Pakistani. It was his misfortune, he claimed, to be the doppelgänger of one of the gunmen shot dead by police. Lacking a culprit to put on trial, they had taken him from his cell the day the attacks were launched, shot him to make it look as if he had been injured in the crossfire and then framed him, he said. "I was not present in the Chhatrapati Shivaji terminus and I did not open firing inside the railway station. I have never seen an AK-47 in my life, or even a rubber dingy," he told the astonished courtroom. It was a remarkable twist, even in a week in which David Headley, the man alleged to have masterminded the attacks, was accused by Indian intelligence sources of acting as a double agent for the CIA and al-Qaida. It is not the first time Kasab has changed his story. The 21-year-old, who faces the death penalty if convicted, initially denied the charges. He surprised everyone – including his lawyer – by changing his plea to guilty in July and regaling the court with an account of how he had travelled to Mumbai by boat from Pakistan with his fellow gunmen to launch the attacks. He would rather be hanged in this world than face God's punishment in the next, he explained. I know many Rajput Pakistanis using the word which means 'Supreme being' and in Quran it tells you God is known by many names. I am speaking of the old generation of people not the new ones. Gupta: "I know many Rajput Pakistanis using the word which means 'Supreme being' and in Quran it tells you God is known by many names. I am speaking of the old generation of people not the new one"
Muslim kids from Okara don't use the name Bhagwan, nor can they quickly acquire other accents by simply learning another language. This video has been posted on many fora and blogs 1000s of time. Where have you been all these years Riaz Haq? Anon: "This video has been posted on many fora and blogs 1000s of time. Where have you been all these years Riaz Haq?" Yes, but it's not a closed subject as long as serious questions about this video remain unanswered. This video has been floating around and is popular in the UK along with a similar conspired and subverted 09/11 video. The Economist did an article titled "Land of Conspiracy theories" or something to that effect. Pakistan was the LAND in the article. Many of the these forums appear on Jihadist websites as well. But you will not find these on any legitimate websites or major media channels unless they are doing a story on conspiracy theories! The video posted on internet is a "natya rupantaran" or a dramatic act by the media to just show the news. Do you really think that Indian police which released only a single photo of Kasab and took him through tunnel everytime to court will post this video. Of all the educated people out there I am finding it funny that you even thought it was Kasab. The guy who was hanged was caught inflagante delicto. The question of his being Punjabi or Indian Punjabi or a Hindu is a political game that our leadership is master at losing. Syed: The guy who was hanged was caught inflagante delicto. The question of his being Punjabi or Indian Punjabi or a Hindu is a political game that our leadership is master at losing." The phrase is en flagrante delicto, meaning red handed. The alleged Kassab figure in the trial argued he was "doppelgänger", a double or a look-alike, according to news reports of his court filings during trial. Wonder what kind of coastguard boat is outrun by an ordinary fishing boat for an hour? An Indian Coastguard boat..
Pakistani authorities reportedly seized two Indian fishing boats on Saturday — a not uncommon occurrence, but one that has prompted greater controversy following a tense week in the waters between the two countries. The boats, containing 12 Indian fishermen, were apprehended by Pakistan’s Maritime Security Agency (MSA) three days after the Indian Coast Guard intercepted an alleged terrorist boat off the Gujarat coast, the Times of India reported. The Indian authorities claim that intercepted wireless communications show the Pakistani boat, which sank about 365 km away from India’s west coast on Jan. 1, to be working with an unidentified vessel nearby and coordinating with a contact in Pakistan as well as the MSA. A statement from India’s Defense Ministry then stated that the four people on board the boat attempted to outrun the coast guard for over an hour, following which they hid under the deck and set fire to the boat, resulting in an explosion. However, naval officers told the Indian Express that it was not possible for a typical Pakistani fishing vessel to outrun the powerful coast guard boats, and local fishermen said they did not see a fire. Moreover, photographs released to the media of the burning boat do not show damage consistent with the detonation of explosives. Pakistan has rubbished claims that the Jan. 1 incident could be linked to terrorism, and there are reportedly no boats unaccounted for in Keti Bandar, the Karachi port where India claims the “suspicious” boat originated from. “No fishing crews or boats are missing from Keti Bandar,” the head of the Pakistan Fisherfolk Forum, Saeed Baloch, told the Express. India’s Defense Minister Manohar Parrikar stuck to his guns Monday morning, telling reporters that people smuggling drugs or other contraband would have surrendered rather than martyr themselves. But that was not enough to placate opposition parties like the Indian National Congress, who urged the government on Monday to make the evidence public. No material evidence from the Pakistani boat or bodies of its crew has been recovered so far because of reported bad weather, but a leading coast-guard official said he was hopeful that more clues would be forthcoming. The Defense Ministry, meanwhile, has ordered a full internal review of the intercepted communications and other evidence. By dressing up “militants” as Muslims wearing skullcaps in a mock anti-terror drill, Indian police exposed not only communal mentality but low IQ and poor general knowledge negating Prime Minister Narendra Modi’s vision of SMART — Strict and Sensitive, Modern and Mobile, Alert and Accountable, Reliable and Responsive, Techno savvy and Trained — law enforcers voiced at the recent conference of directors-general of police in Guwahati. Footage of the drill showed commandos capturing “terrorists” in white-knitted skullcaps before bundling them into police jeeps. But do terrorists — even if they happen to be Muslims — don the Islamic skullcap to unleash murder and mayhem? I don’t think so. The latest Global Terrorism Index (released by international think tank Institute of Economics and Peace) reveals that while jihadists were responsible for 15 percent of terrorism-related killings in India, Maoists accounted for the lion’s share of casualties — a whopping 50 percent — in 2013. The remaining 35 percent of deaths were caused by guerrillas fighting for statehood or independence in states like Assam, Manipur and Nagaland. Maoists have created a Red Corridor from the India-Nepal border to south India but the worst-hit states are Chattisgarh, Bihar, Jharkhand and Orissa. Their goal is to overthrow the Indian government by force. The writ of the administration doesn’t run in large tracts of central India where there are no police stations, post offices, revenue collectors or even cellular network. Similarly, the National Democratic Front of Bodoland (NDFB), which gunned down 75 Adivasis or tribespeople, just before Christmas in its devilish pursuit of a separate homeland for ethnic Bodos in Assam, is one of the deadliest separatist outfits in business. New York survived 9/11. Mumbai is doing fine despite 26/11, thank you. I think that armed rebellions like the Maoist insurgency or secessionist uprisings in the northeast pose a far graver challenge to the Indian State. New Delhi should focus on neutralizing anti-national groups trying to seize power or dismember India instead of maligning Muslims who have never challenged the state till today. In a shocking disclosure a former officer of the Indian home ministry has alleged that Indian government had orchestrated the two high-profile terrorist attacks which New Delhi has blamed on Pakistan-based militant groups. According to India’s Times of India (TOI) newspaper, RVS Mani, who as home ministry under-secretary signed the affidavits submitted in court in the Ishrat Jahan ‘fake encounter case’, has said that Satish Verma, until recently a part of the Central Bureau of Investigation-SIT probe team, told him that both the 2001 attack on Indian parliament and the 2008 Mumbai attacks were set up “with the objective of strengthening the counter-terror legislation (sic)”. In what is certain to escalate the already vicious fight between the CBI and the IB over the IshratJahan "fake encounter case", a former home ministry officer has alleged that a member of the CBI-SIT team had accused incumbent governments of "orchestrating" the terror attack on Parliament and the 26/11 carnage in Mumbai. R V S Mani, who as home ministry under-secretary signed the affidavits submitted in court in the alleged encounter case, has said that Satish Verma, until recently a part of the CBI-SIT probe team, told him that both the terror attacks were set up "with the objective of strengthening the counter-terror legislation (sic)". Mani has said that Verma "...narrated that the 13.12. 2001(attack on Parliament) was followed by Pota (Prevention of Terrorist Activities Act) and 26/11 2008 (terrorists' siege of Mumbai) was followed by amendment to the UAPA (Unlawful Activities Prevention Act)." A Russian Communist Party newspaper is claiming Russia will publish satellite photos that claim the U.S. was involved in the Sept. 11, 2001 terrorist attacks. It comes as a top Russian aide warned the U.S. to not “arm Ukraine” in the country’s fight against separatist rebels in the east. Pravda, which was the mouthpiece of the Soviet Union before it collapsed, claims that “Putin is going to hit once, but he’s going to hit hard.” Pravda is currently owned by the Communist Party of the Russian Federation, but it was used as a propaganda tool by the Soviet Union for most of its existence and particularly under dictator Joseph Stalin. The current form of Pravda isn’t much different, which features a smorgasbord of pro-Russia and anti-America articles with inflammatory headlines like “USA creates Fourth Reich to destroy Russia,” “America’s Iron Curtain,” and it has published articles touting Russia’s nuclear arsenal. Also, the timing of the article should be questioned, as the U.S. and Russia have been in a tense international standoff over Russian-backed militants fighting to control parts of eastern Ukraine. The Pravda article also claims a portion of the alleged satellite photos are from the website www.secretsofthefed.com. ISLAMABAD: The young man arrested from Udhampur for his involvement in an attack on a convoy of Indian security forces is a resident of Indian Occupied Kashmir (IOK). Senior journalist and anchor for Geo News programme ‘Capital Talk’ Hamid Mir said the young man was a resident of a Ghat village located in Kulgam district of IOK near the Jhelum River. The senior journalist also revealed that the attacker had worked as a bus conductor and was known popularly in the area as ‘jhalla’ (mad person). According to Hamid Mir nine relatives of the attacker are among the fifteen people arrested from the village. The attacker’s immediate family has fled the village. Sources told Hamid Mir that the second attacker, Nauman, who was killed is also a resident of IOK and that the plan of attack was made in Ghat village. Indian media had claimed that this second attacker was also Pakistani, belonging to Bahawalpur. Indian media had labeled the attacker as “Kasab II” after the lone surviving gunman from the 2008 Mumbai attacks. Indian Home Minister Shri Rajnath Singh also claimed the identity of the captured individual to be Mohammad Naveed Yakub aka Usman, resident of Faisalabad in Pakistan. Pakistan’s National Database and Registration Authority (NADRA) dismissed Indian allegations stating that Usman is not Pakistani. In an unexpected turn, a key witness in the 26/11 Mumbai attacks claimed Ajmal Kasab, the lone gunman caught alive after the attack and later hanged, was alive. Pakistan-born Kasab was hanged at Yerwada jail in Pune in the western state of Maharashtra in 2012 after President Pranab Mukherjee rejected his pleas for mercy. Kasab, 25, was one of 10 gunmen who laid siege to the city in attacks that began on November 26, 2008, and lasted nearly three days, killing 166 people. The hearing of the case was held on Wednesday, by an anti-terrorism court (ATC) judge at Adiala Jail in Rawalpindi. “The headmaster caused a lot of embarrassment for the prosecution team by claiming that Ajmal Kasab is alive. He was supposed to present the record of the period during which Ajmal Kasab studied in the school and other relevant record but talked otherwise. The prosecution also failed to properly examine him,” the official said. According to the official, the headmaster who belonged to the native town of the accused Zakiur Rehman Lakhvi, may have testified under Lakhvi’s pressure. The headmaster during Wednesday’s hearing maintained a statement that he gave in May 2014, that Kasab was still alive and claimed that he could also be produced in court if needed. However, the headmaster made no reference to Kasab, neither did he mention if the accused was the same person who studied in the school in Faridkot. Following Pathankot attack, the Indian media and government authorities have been referring to Mumbai attack as Pakistan’s work despite the fact that the Wikileaks had shown both the US and the British authorities trashing Indian so-called evidence against Pakistan. Publicly both Washington and London have been shy to embarrass India and avoided rejecting her allegation against Pakistan but the Wikileaks showed the two trashing Indian claims about the involvement of either Pakistan’s prime intelligence agency- the ISI- or even senior leaders of a proscribed organisation. Wikileaks, which contained secret State Department wires, had quoted former US ambassador to Pakistan Anne W Patterson as writing to the State Department that India had presented insufficient evidence against the senior leaders of now proscribed Lashkar-e-Taiba. Anne W Patterson had mentioned in a wire to the Washington that Federal Investigation Agency (FIA) and other investigators had insufficient evidence for prosecution against Lashkar-e-Taiba’s Zaki-ur-Rehman Lakhvi, Zarar Shah and Mazhar Iqbal Alqama. Patterson had even said that FIA was forced, as a result of political pressure, to arrest and charge the three LeT leaders and that FIA was still without solid evidence to begin a formal trial. The wire, generated from New Delhi, had also shown the Indian politicians reminding the Americans that India had sided with US on the issue of 9/11 despite the absence of concrete evidence. The wire said: “At dinner with CIA Deputy Director of Intelligence Carmen Medina on October 23rd, former National Security Advisor Brajesh Mishra raised the issue of the US response to the Mumbai blasts. Another leak, a wire sent from US New Delhi embassy to Washington, reflects on British doubts about Indian’s evidence against Pakistan. Now yet again after Pathankot attack, Indians have started blaming Pakistan claiming that they have evidence of Pakistan's involvement. Successive governments in New Delhi have been allowed to deceive India's public for too long with false claims that are nothing more than a cover for the complete strategic and policy vacuum that characterises state responses to Pakistan-backed terrorism. Indeed, it is now time to nail India's lie about nailing Pakistan's lies. TWO Pakistanis arrested by the Army on charges of facilitating the attack on the 12 Infantry Brigade’s headquarters in Uri are Class 10 students who strayed across the Line of Control (LoC), the family of one and the principal of his school have told The Indian Express. The Ministry of External Affairs said the two had confessed to facilitating the “infiltration of a group of four Jaish-e-Muhammad cadre who carried out the Uri army camp attack.” Faisal Husain Awan, a resident of Potha Jandgran near the village of Koomi Kote in Pakistan-occupied Kashmir, and his school-friend Ahsan Khursheed, from Khilayana Khurd in Muzaffarabad’s Hattian Bala tehsil, were arrested on September 21, three days after the attack which claimed the lives of 19 soldiers. Both these villages are an hour’s walk from the LoC near Uri. Ghulam Mustafa Tabassum, Faisal Awan’s brother and a Lahore-based physician, says the two were at home on September 17, the date GPS data recovered from the terrorists by the National Investigation Agency and published by this newspaper last week, shows the Uri terrorists crossing the Line of Control. Basharat Husain, the principal of the the Shaheen Model School in Muzaffarabad, said Awan was a science student who had just graduated from Class IX with a first division. Both boys, according to school documents provided by Husain, were 16 years old which — if these documents are authentic — makes them juveniles under Indian law and entitled to special protections, irrespective of their nationality. The Army, which on September 24 said the two were “Pakistan-occupied Kashmir nationals who have been working for Jaish-e-Muhammad terror outfit” said, in an e-mail response to the The Indian Express, that this determination was based on what it described as “spot interrogation.” However, the e-mail did not answer whether the Army had obtained the ages of the two while arresting them. The Army referred this newspaper to the NIA. An NIA spokesperson said the agency “is in the process of analysing the available evidence in the case before we submit the Final Report to the court.” He said “the age (of) the two arrested persons was recorded as per statements given by them after their arrest,” but did not specifically state if they were known to minors. However, sources said that no evidence had been found to support the contention that the two were linked, in any way, to the Uri attack. Incompetence is a fact of life, but there are times when the incompetence theory is strained to the breaking point and it is more rational to posit deliberate deception. In the case of the Mumbai investigation, Davidsson depicts its failures as going well beyond incompetence. Neither the police, nor the judge charged with trying the sole surviving suspect, made public a timeline of events (188-189; 688-689). Even the most basic facts of when a given set of attacks began and when they ended were left vague. Key witnesses were not called to testify. Witnesses who said they saw the terrorists commit violence, or spoke to them, or were in the same room with them, were ignored by the court (e.g., 279 ff.). Contradictions and miracles were not sorted out. One victim was apparently resurrected from the dead when his testimony was essential to the blaming of Pakistan (229-230). A second victim died in two different places (692), while a third died in three places (466). No one in authority cared enough to solve these difficulties. Eyewitnesses to the crime differed on the clothing and skin color of the terrorists, and on how many of them there were (328-331). No resolution was sought. At least one eyewitness confessed she found it hard to distinguish “friends” from terrorists (316). No probe was stimulated by this odd confusion. The number of terrorists who committed the deeds changed repeatedly, as did the number of terrorists who survived (29 ff. ; 689). Crime scenes were violated, with bodies hauled off before they could be examined (682-683). Identity parades (“line-ups”) were rendered invalid by weeks of prior exposure of the witnesses to pictures of the suspect in newspapers (101; 582). Claims that the terrorists were armed with AK-47s were common, yet forensic study of the attack at the Cama Hospital failed to turn up a single AK-47 bullet (156). Of the “hundreds of witnesses processed by the court” in relation to the attacks at the CaféLeopold, Taj Mahal Palace Hotel, Oberoi-Trident Hotel or Nariman House, “not a single one testified to having observed any of the eight accused kill anyone” (40). Indian authorities declined to order autopsies on the dead at the targeted Jewish center in Nariman House. The dead, five out of six of whom were Israeli citizens (427), were instead whisked back to Israel by a Jewish organization based in Israel, allegedly for religious reasons (453). Religious sensitivity seems to have extended to a large safe at the crime scene, which the team also transported to Israel (454). The surviving alleged terrorist had no public trial (661). No transcript of his secret trial has been released (670). One lawyer who agreed to defend the accused was removed by the court and another was assassinated (670). The public was told there was extensive CCTV footage of the attacks, despite the mysterious malfunctioning of the majority of CCTV cameras on the days in question (97-98; 109 ff. ; 683 ff. ); but only a very small percentage of the claimed footage was ever released and it suffers from serious defects–two conflicting time-stamps and signs of editing (111). Members of an elite Indian commando unit that showed up with between 475 and 800 members to battle eight terrorists (534) were not allowed to testify in court (327; 428-429).